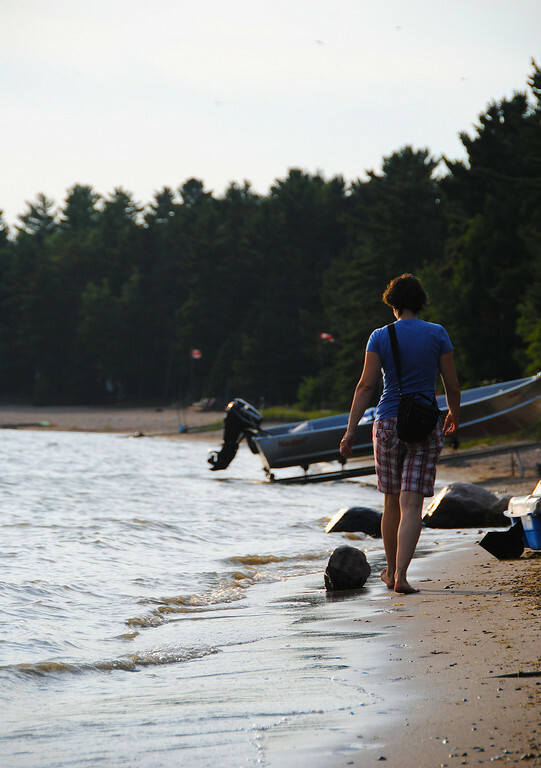 Jul 15 2012: Goodbye, Ontario! 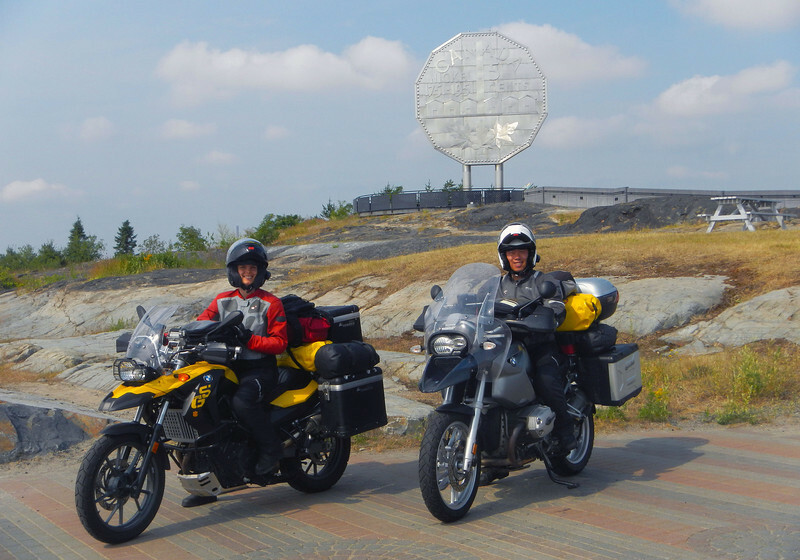 The ride back to Ontario from New Brunswick was a quick affair on the highway and was quite eventful, thanks to a broken master link on Khanh's VFR's chain. 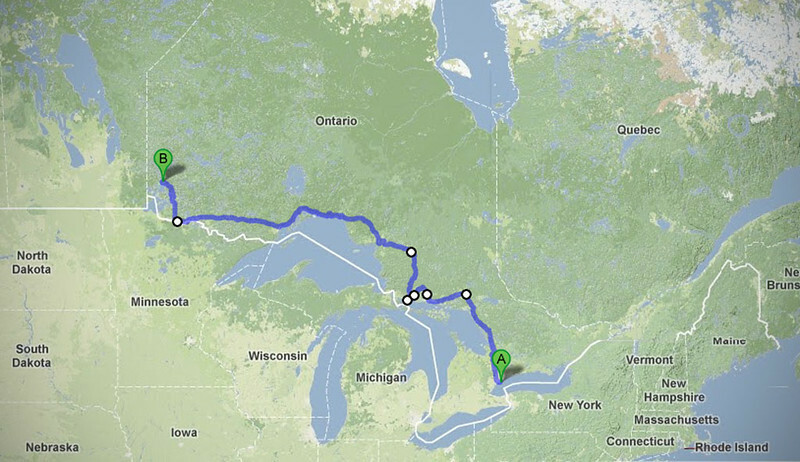 We put together two CAA calls to tow us from Perth, and then from Trenton back to Toronto, arriving at an ungodly 2AM. Alas, our test trip to the East Coast was over, now to prepare for the real thing! We stopped in Sudbury to take our obligatory picture in front of the giant nickel outside of the Science North building. We must have 3 different shots of this from 3 different road trips. It was only once we traveled north of Sudbury that we felt like a dog that's broken it's leash, riding into new territory! Part of our resolution for this trip is to take all the backroads that we never had time to explore because we had to make a destination for the night. We did learn some lessons from our trip out east though, which was that although we had the luxury of time, we traded for that at the expense of budget. So all the grocery shopping, preparing food, washing dishes and cutlery, setting up/tearing down of tents, etc. 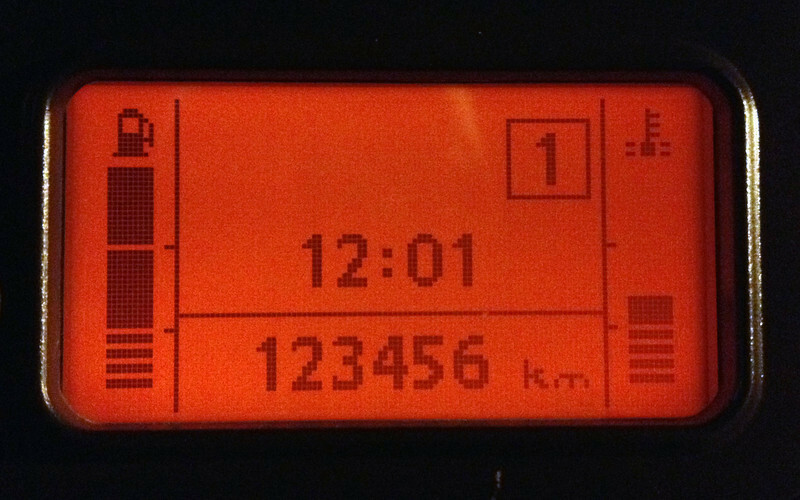 actually cost us a bit more time than if we had just checked into a motel at the end of the riding day and ordered a pizza or ate at a restaurant. 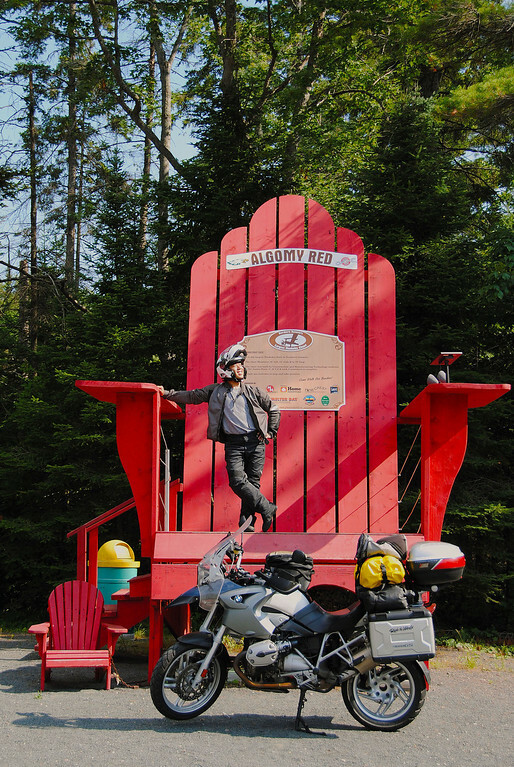 Giant Muskoka chair outside the Pinecrest campsite in Thessalon. 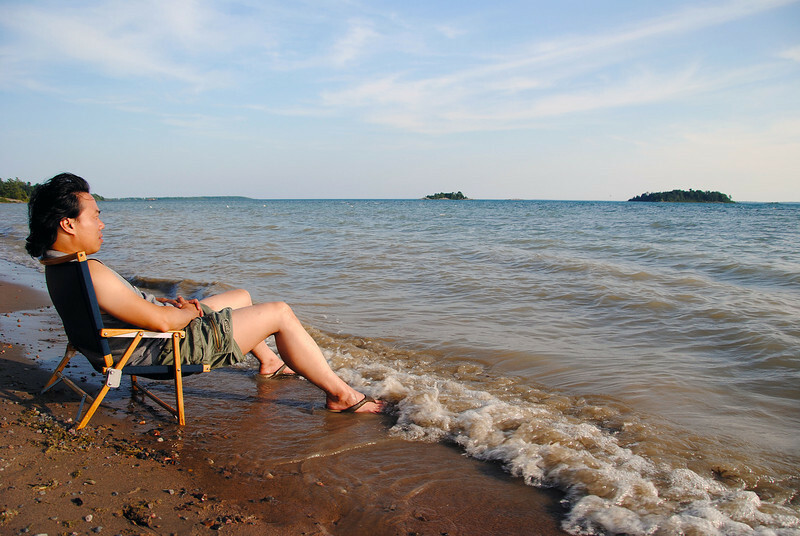 We stayed at a great campsite along the northern shores of Lake Huron, the beach was a few feet away from our tent and we relaxed on the shores for the evening and fell asleep to the sound of waves gently lapping the sandy beach. This camping thing is pretty new to me and I'm amazed that folks will park a camper for the summer at a campsite and make it their seasonal cottage! Lots of campers with patio stones, lawn gnomes and furniture outside! The next morning, we venture out onto new roads. 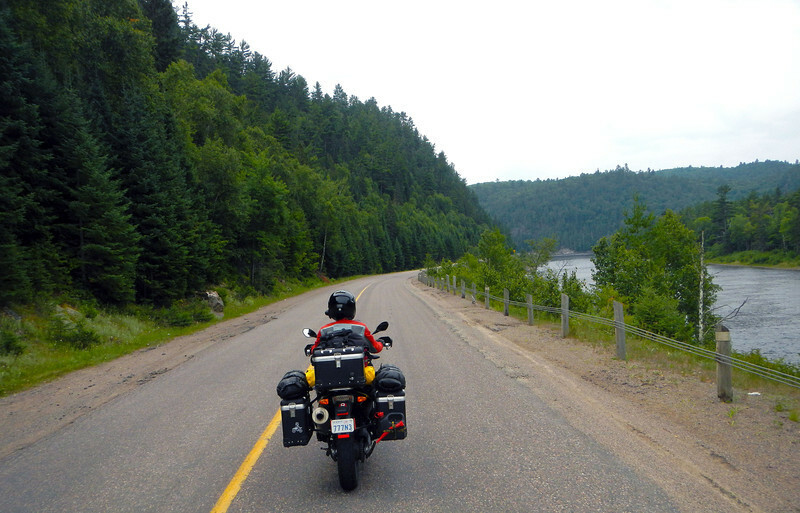 We're bypassing the very scenic Hwy 17 from Sault-Ste Marie to Wawa, since we've done it already, but I'd recommend it to anyone who's riding in the area - the sweeping turns and numerous elevation changes are made all the more spectacular by the sight of Lake Superior off the west side of the road. Instead, we're now riding Hwy 129 north from Thessalon. 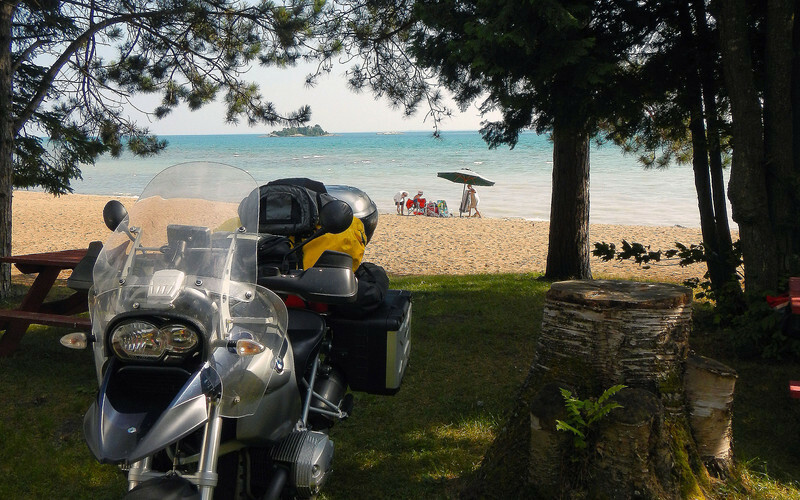 It's often called Ontario's Tail of the Dragon, because Tennessee 129 shares the same number. It's nowhere as tight and twisty, but the first 60 kms have amazing fast sweepers, great pavement and lots of 270 degree turns that have you leant over for what feels like an eternity! What a riot! 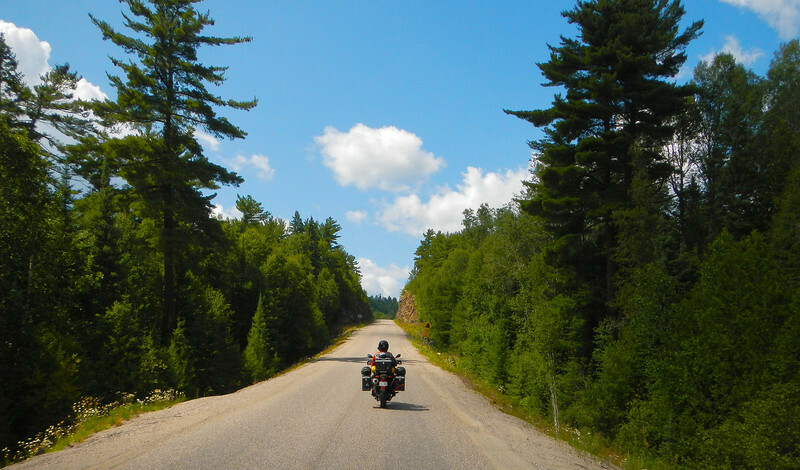 The rest of the road is your normal Northern Ontario scenic route.